The British high street has lost a few big retail names in recent years. How can brands compete in the age of Brand Commerce? It would be easy to view the recent demise of BHS as (among other things) yet another harbinger of the death of the high street at the hands of eCommerce. In contrast is Sainsbury’s proposed takeover of Argos. Argos’ same-day delivery offering and click and collect model - enabled by its high street footprint - must factor among the group’s appeal for Sainsbury’s. Meanwhile, rumours abound that Amazon are to invest in 400 brick-and-mortar stores, while online businesses such as Birchbox and Zappos are also experimenting offline. Warby Parker, the online glasses retailer, has opened 31 stores and is now one of the top-grossing retailers in the US in sales per square foot, second only to Apple. Far from killing off the high street, the future of commerce will see on- and offline experiences overlapping in smarter ways to enhance the customer experience. Developments in technology - from connected stores to virtual aisles - have blurred the boundaries between online and offline. This opens up new roles for bricks and mortar - from fulfilment and logistics to brand experience. The "right" role for physical stores will vary by brand and by location, and smart brands will think about how to deploy their real estate in the context of a portfolio of ever expanding shoppable touchpoints - as one aspect of a connected, unpredictable and multi-channel user journey. Meanwhile, technologies such as shoppable content, social commerce and one-click ordering have created a climate in which shopping is no longer an activity, but something that is always on. In the past, the gap between points of inspiration and points of transaction was significant. Consumers might view an inspiring piece of content then sometime later find themselves at the point of purchase. We hoped that the brand associations we created were powerful enough to endure. The Internet has closed that gap. Wherever we see relevant content, we are empowered to transact. The distance between points of inspiration and points of transaction has disappeared. We call this Brand Commerce. This is not just about effortless transaction (buy buttons are a small part of the answer), but about delivering a consistent brand narrative across every touchpoint - from purchase to payment to delivery. So how do brands compete in the age of Brand Commerce? As marketers, we tirelessly discuss brand purpose and tone of voice. In the age of Brand Commerce, it is equally important that we define our brand behaviours and how those behaviours come to life in a retail experience. A brand that is all about instant gratification will behave very differently to a brand that is about exploration, serendipity or community. Giving a better retail experience to car buyers when researching and buying a car is challenging. 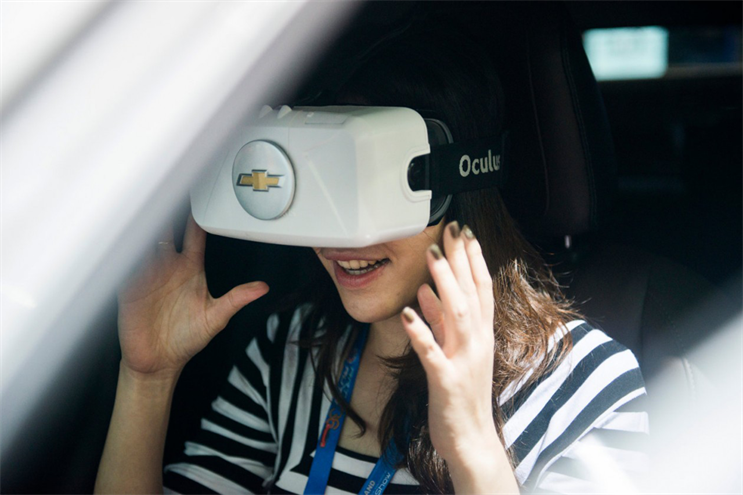 Acknowledging this, Chevy Australia, in collaboration with Isobar Australia, developed "CoDrive", a VR experience allowing showroom customers to experience a passenger drive through the outback, using Oculus Rift. Forty-one per cent of all online purchases start on one device and finish on another, while 84% of smartphone users use their phone in store. Faced with these non-linear journeys, we must move beyond optimising a single user journey towards dynamically optimising for hundreds of potential journeys. This requires a unique combination of programmatic capabilities and experience design, enabling a single view of the user across channels and devices, a dynamic understanding of their current context (mood, location, need) and the ability to deliver the right experience in the right moment. Think about a customer who sees an advert for one of your products in a newspaper on their way to work, then browses your website on their smartphone, before later ordering online on their desktop computer at work for in-store collection. Your branding and user experience must be consistent across this entire customer journey – from the first point of inspiration to the point of transaction and beyond. Understanding context should also help brands think about commerce as a portfolio offering. Offline, brands can comfortably exist across touchpoints from concept stores to outlet malls to vending machines. Online, they may sell everywhere from a messenger bot to a virtual showroom. Starbucks for example have focused huge energy on removing friction (through mobile pre-ordering), but in parallel have developed concept stores celebrating the theatre of coffee brewing. They have designed for acceleration but also contemplation. The challenge is to use portfolio thinking to balance the competing imperatives of margin, reach, data ownership and brand experience. With this in mind, Clarins, in collaboration with eCommera, developed a direct-to-consumer proposition that offers a personalised experience, including a Beauty Consultation Tool through which users create their customised beauty regimes online, and captures new kinds of user data for the brand. This sits comfortably alongside existing retail partnerships. Successful brand commerce initiatives combine robust business and technology roadmaps with an agile approach to development. Brand Commerce initiatives can represent significant investment. It is critical to break these projects down, mapping business impact versus complexity to develop a roadmap that enables both quick wins and long-term transformation. It is important to remember that as seductive as new technologies are, a robust technology solution is critical to long-term success. Yet in today’s ever-evolving landscape, marrying robust solutions with speed to market is key. This new landscape throws up some fascinating questions and opportunities for brands and agencies. Angela Arhendts, formerly of Burberry, once said "Burberry brings our digital world to life in a physical space… walking through the doors is just like walking into our website". Entering the website, by extension, should feel just like walking into the store. But what is the digital equivalent of a marble floor, an expensive scent, a charming and expert sales force? How do we infuse online retail experiences with brand values? Answering these questions paves the way for some fascinating collisions of talent, pairing personal shoppers with data scientists, visual merchandisers with user experience designers. Most importantly, however, a relevant and consistent brand story will drive a unified and compelling customer experience. As Maya Angelou once said, "People will forget what you said, people will forget what you did, but they will never forget how you made them feel". Emotional coherence will trump illusions of perfect control. Written by Pats McDonald, chief strategy officer at Isobar and Eric Fergusson, director of retail services at eCommera.